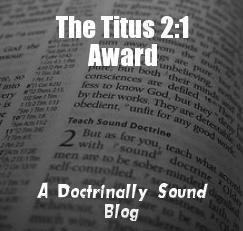 While we have not yet fully recovered from our travels, I wanted to take some time to thank One Christian Dad for nominating us for the 3rd Annual Titus 2:1 Awards. My wife and I were extremely blessed as we read about it on my smart phone while on vacation. Now that I’ve had some time to rest a bit and catch up on email and social media, let’s answer some questions. If you could have dinner with any historical Christian figure, who would it be and why? This is a thought that crosses my mind regularly. My mind goes to Paul, Silas, Peter, and John the most often. Today, as I think about this question, my answer leans towards two other names, James and Jude. We only got one letter from Jude, and it turned out to be very different from the letter he had set out to write. I’d love to sit down with him to learn some more about the issues he was seeing in the church at that time. I find myself returning to Jude so often these days. What 1 burning question would you ask? “What happened next?” would undoubtedly be the biggest question. I’d probably also like to hear what he was eager to write about our common salvation. Where and what would you eat? After having spent over a week with extended family in Puerto Rico, I’d say it would be in a home on the coast, with fresh-baked Puerto Rican bread (pan de agua), seafood stuffed mofongo, with a fresh salad. After dinner, a nice cup of coffee. What was the last Bible verse you read? Well, Jude 1 for this post. Prior to that, however, I was reading Matthew 15:1-9 for a Facebook Discussion on my personal page. This is my first year blogging, and our family has been blessed by many a blogger both large and small. I’ve had wonderful interactions with One Christian Dad, despite our different perspectives and backgrounds, and gladly call him my brother in Christ. My Word Like Fire — This blog focuses on the infiltration of mysticism and the new age into Christian churches. His primary concern is with the false doctrine of Alcoholics Anonymous and its false teaching, but he writes and shares other articles that resonate with me. Myself coming from a Charismatic/Word of Faith background, I see where so much of the Evangelical church has swallowed new age thought as “innovative Christian thought” hook-line-and-sinker. Once again, I’d like to thank One Christian Dad for following and engaging with this site, and for the encouragement brought by this award. While we hope to make some adjustments to our blog schedule, clearly DiM Tuesdays will remain a primary focus beginning again next week.